(Houston) – Construction crews will close the Pelican Island Bridge in Galveston during early morning and nightly intervals starting Monday, June 27 at 6 p.m. for about two months. The closures will allow crews to replace the fender system that protects the bridge from maritime traffic traveling through the Galveston Channel. We were recently notified by the Galveston Navigation District and the Texas Department of Transportation of a change that will start June 27th. The bridge will close to vehicular traffic from 6 pm to 9 pm and will reopen to vehicular traffic from 9 pm to 9:30 pm. Closures will continue through the night as per the original schedule. The bridge will be under normal operations from Friday through Monday. Crews will replace the fender system, which had been severely damaged during Hurricane Ike in 2008. Construction is being overseen by the Texas Department of Transportation and the Galveston County Navigation District. The project will cost $2.5 million. HOUSTON – The Harris County Flood Control District will begin construction on the first of the final four roadway bridges associated with the $379 million Sims Bayou Federal Flood Damage Reduction Project at the first of next month. The four roadway bridges cross Sims Bayou at Heatherbrook Drive, Croquet Street, South Post Oak Road and Hiram Clarke Road in southwest Houston. The bridges will be reconstructed in that order. The U. S. Army Corps of Engineers is the lead agency on the Sims Bayou Federal Flood Damage Reduction Project, which includes the widening and deepening of 19.3 miles of Sims Bayou and adding environmental enhancements from the Houston Ship Channel to Croquet Street, just west of South Post Oak Road. The project is supplemented by three stormwater detention basins that were excavated by the District using local funds. The project also consists of the modification/replacement of 20 roadway bridges, of which 16 are complete. 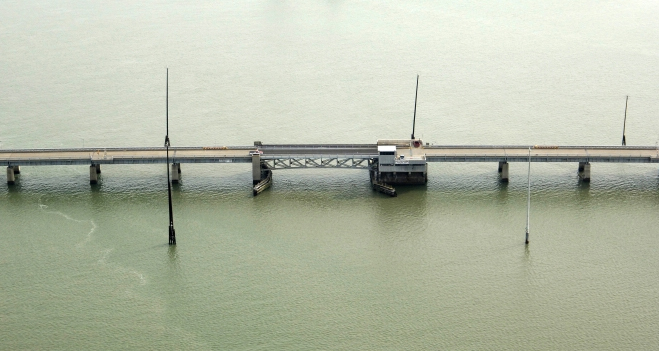 Construction of the remaining four bridges marks the final phase of the project, which launched in 1990 and is scheduled for completion in late 2012. Effective Wednesday, June 1, 2011, contractors will begin work on the Heatherbrook bridge. The bridge will be closed and traffic will detour around the construction zone via Amble Lane and Darlinghurst Drive when traveling west from S. Post Oak, and via Croquet when traveling east. This bridge will be closed for approximately six months. After the new bridge at Heatherbrook opens, construction will begin on the bridge at Croquet, which also will be closed for approximately six months. Traffic will detour around the construction zone via Darlinghurst when traveling south and via Heatherbrook when traveling north. Motorists are encouraged to be alert, pay attention to all posted street and lane closures and to follow traffic detour routes in the area. To maintain traffic flow through the heavily traveled S. Post Oak and Hiram Clarke corridors during construction, only one side of each bridge will be taken out of service at a time. The construction schedule and detour routes for these bridges will be announced at a later date. At the completion of the Sims Bayou Federal Flood Damage Reduction Project, the 1 percent (100-year) floodplain will be removed from approximately 35,000 homes and 2,000 commercial structures, meaning flooding risks will be greatly reduced for citizens residing in neighborhoods adjacent to Sims Bayou. Please be aware that all closures are subject to change. For more information on the Sims Bayou bridge projects, including details on lane closures, major traffic switches, local detour routes, the anticipated schedule for construction on the S. Post Oak and Hiram Clarke bridges, and the opportunity to sign up to receive regular email updates, please visit the Sims Bayou Roadway Bridge Construction webpage at HCFCD.org/simsbridges or call the Sims Bayou bridge construction hotline at (713) 684-4107.